From Einstein's Ghost To Pluto, A Year Of Remarkable Science : 13.7: Cosmos And Culture The year 2015 was a busy one for science, with discoveries on many fronts. Astrophysicist Marcelo Gleiser offers thoughts on a few. 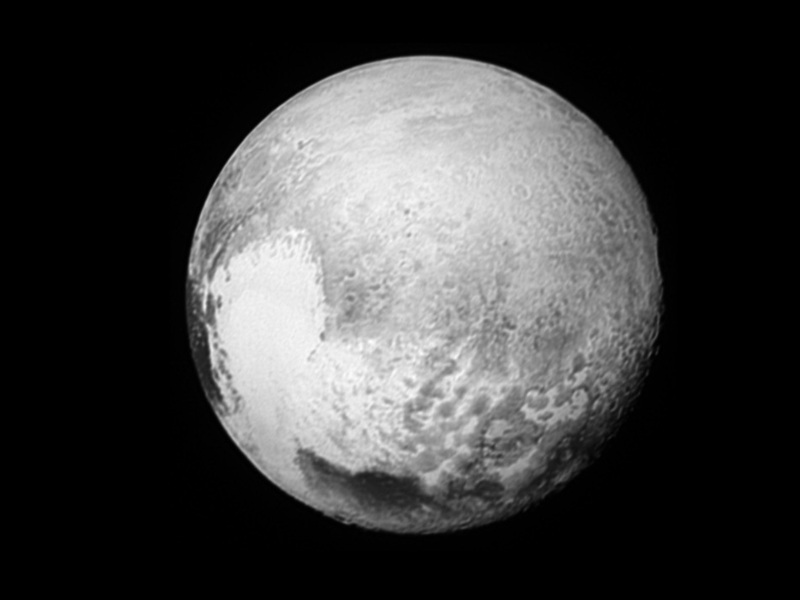 NASA's New Horizons spacecraft returned images, such as this one, to improve maps of different regions of Pluto. Large Hadron Collider (LHC) ends year with a cliffhanger. The behemoth particle collider at CERN, the European Organization for Nuclear Research, ended the year announcing a mysterious bump in the data that could be a new, super-heavy particle — a kind of obese cousin of the Higgs boson. Although it's too early for any kind of conclusion, the signal was seen by CERN's two giant detectors, Atlas and CMS, which makes it less of a chance event. The bump, if confirmed, would correspond to a new particle that can open a series of avenues for the future of particle physics. More will be known next year, as the accelerator produces more data and improves statistics. New Horizons space probe flies by Pluto. After traveling for nine years at a speed of about 36,000 miles per hour, the grand-piano-sized space probe arrived at a distance of 7,800 miles from the dwarf planet on July 14, 2015. The images and data from Pluto reveal remarkable and unexpected geological features, rugged, mountainous terrain sculpted by yet unknown forces. The flight was a triumph of space technology, and a crowning achievement of the current generation of space scientists — the exploration and mapping of all the major worlds of our solar system. SpaceX rocket lands vertically after completing mission. In an amazing and unprecedented feat, Elon Musk's private space exploration company SpaceX managed to deploy 11 telecom satellites and return the massive first stage of the Falcon 9 rocket ship back to Earth, landing it safely on the ground. As in sci-fi movies, a spaceship that can land back on its feet opens a new chapter in space exploration, promising a dramatic cut in space travel costs. As the technology becomes more reliable, we can envisage a future of affordable space tourism and commercial exploration. Loopholes eliminated in Albert Einstein's ghost experiment. Einstein wanted physical reality to be intelligible, independent of any random actions. If two events separated in space have some sort of correlation, there must be a reasonable explanation for it. By reasonable, Einstein meant "realist," a fancy word that means that the objects have physical properties that depend on their position and that they can somehow exchange information that propagates through space. They should be able to communicate at speeds at, or slower than, light. Otherwise, Einstein said, it would be like having "spooky actions at a distance," i.e. Einstein's ghost. Well, Einstein lost. Three recent experiments confirmed that the realist expectation failed; in quantum mechanical systems (small things like atoms, material particles and photons, the particles of light) spooky action at a distance is a reality. Objects, even if separated by large distances, form an indissoluble unit with one responding to the other in ways that defy local explanations with signals traveling at or slower than light. This nonlocality is profoundly mysterious, even if it lends itself to many interesting technological applications, including quantum cryptography, the ability to send messages perfectly protected from eavesdroppers. Einstein's ghost lives. Marcelo Gleiser is a theoretical physicist and cosmologist — and professor of natural philosophy, physics and astronomy at Dartmouth College. He is the co-founder of 13.7, a prolific author of papers and essays, and active promoter of science to the general public. His latest book is The Island of Knowledge: The Limits of Science and the Search for Meaning. You can keep up with Marcelo on Facebook and Twitter: @mgleiser.